Hope you're all doing really well? Before I get into this post I just wanted to take the chance to thank you all for such a warm response towards my '6 blogger apps you need for 2016' post. I do get very nervous stepping outside of my comfort zone sometimes, but I've had so many lovely messages and direct messages about this post! I'm definitely interested in doing more, so please leave any suggestions you have below. Now... It's no secret that I'm a bit of a NEOM fanatic, but honestly I'm literally bowled over by the quality of their products and customer service. I often purchase from NEOM for my friends and family and I've also been lucky to work with them on a few blogger projects too (hint) - I have to admit I'm not the best sale shopper, in fact I'm rubbish. I seem to miss everything I want and scrambling around in busy shops makes me feel a little anxious. When I seen that NEOM had a sale on with up to 50% off, I just couldn't help but treat myself to a gorgeous gift set. I hope you enjoy this post lovelies and I would love to hear your thoughts on this post below! Now I know Christmas is over, but honestly I think you can't go wrong with a cosy warming scent regardless of the time of year. I believe his fragrance is still available online at NEOM, but if not it's also available at Look Fantastic (£38), if you like the sound of this I would hurry, as I expect it to be completely sold out soon! I was also lucky enough to try their Perfect Peace Candle (see full review) and wanted to get my hand on the Christmas Wish Candle, but with a busy schedule I just didn't get around to ordering in time for Christmas. 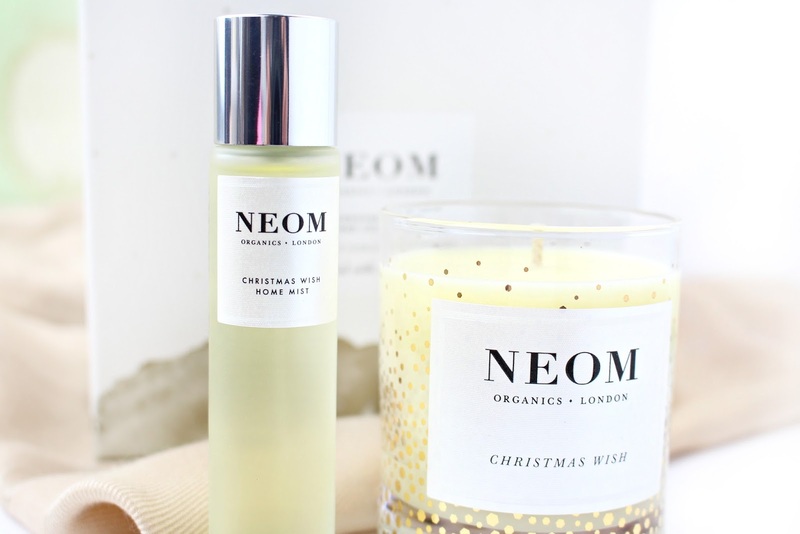 So, as you can imagine I was over the moon when I saw that NEOM had this Beautiful Christmas Wish Collection as part of their up to 50% off sale. Christmas Wish is a beautiful warming blend of Cinnamon, Mandarin and Tonka Bean, along with eleven other specially selected pure essential oils to create a stress relieving aroma. Now I have to mention the absolutely beautiful packaging and this year NEOM have really gone to town and sprinkled 18ct gold onto their beautiful glass jars (Platinum for the Perfect Peace Candle) which I think really makes this candle stand out. Next we have the Christmas Wish Home Mist which is described as a relieving, light mist designed to eradicate stress and daily troubles. It has exactly the same scent as the candle and I love to spritz this over my cushions, PJs and even around my living room by the log fire! The warmth of the burning wood and the warming scent of Cinnamon, Mandarin and Tonka bean is just like heaven! I'm a cosy kinda girl and I love nothing more than nice PJs and cuddles, so if you're similar to me this scent is just perfect. 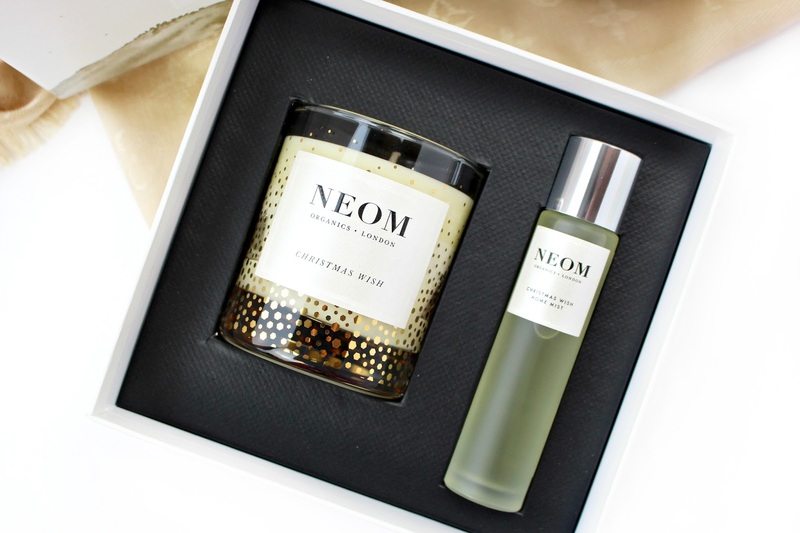 The quality of the packaging is also fantastic and honestly NEOM never disappoint in their presentation and overall quality. I'm super happy that I managed to not only get a gorgeous candle, but also a lovely home mist within the gift set! Even though it's not Christmas anymore, I'm definitely going to get my use out of this gift set, as it's such a relaxing fragrance. I work in marketing & hospitality, so anything deeply relaxing gets the thumbs up from me! 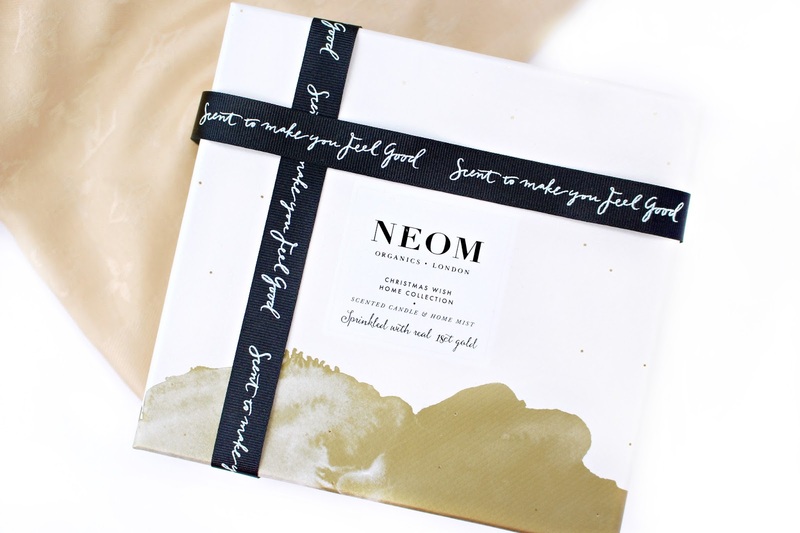 NEOM currently have a 40% off sale (I believe this particular gift set is only available here though) but it's definitely worth checking out the NEOM sale, as I'm sure they will have some fantastic goodies... I'm actually off there now! I would love to hear about what goodies you picked up in the Sales! These look amazing! I've seen their candles a lot recently, they must smell great! This sounds lovely. I have never heard of it - what a fabulous purchase! !